On 30th April 2015, we will be celebrating 21 years since the children of Caol Primary School founded their own art studio. Since 1994, successive groups of young people have kept the studio running without ever falling behind with their class work. Working with 4 different adult Artists in Residence over 21 years, generations of children at Caol Primary School have achieved truly remarkable things. They have mounted exhibitions in Tate Modern, The National Galleries of Scotland and the Irish Museum of Modern Art. They have commandeered a global company’s corporate social responsibility programme with an ambitious plan to bring creativity to under privileged children throughout the world. They have raised funds to travel the world, and to employ adults to run a global operation on their behalf. They have taken thousands of photographs, sent millions of e-mails, hosted hundreds of visitors. They have even, on occasion, found time to clean the studio sink. Out of this first Room 13, our worldwide network of studios has grown. 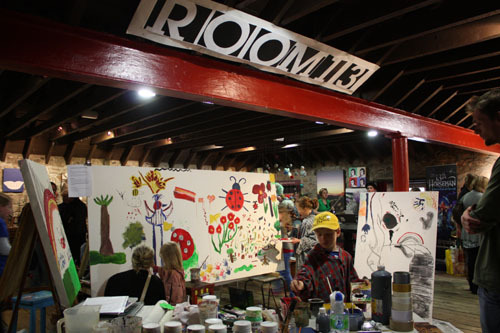 The charity, Room 13 International was set up to support a worldwide community of art studios run and managed by the people that use them. 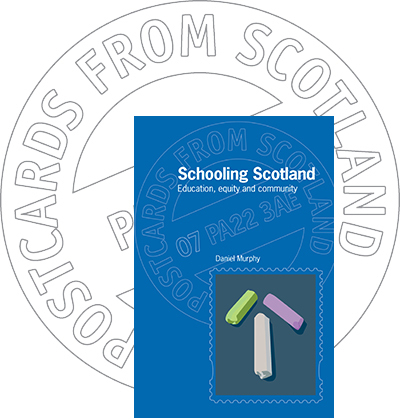 Room 13 studios now exist in a range of school and community settings across Scotland and throughout the world. 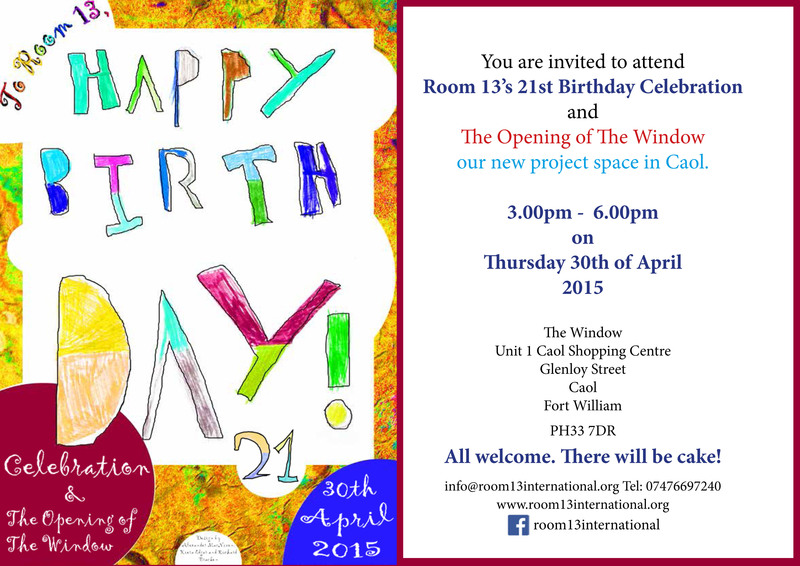 Celebrating Room 13’s 21st Birthday, we will be joined by members of the current Room 13 studio management team, along with members of the Caol Primary School community, and hopefully some familiar faces from years gone by. Room 13 Community Studio in Caol was the focal point for our 2013 summer programme. which included Portfolio Preparation for senior school pupils, workshops for Very Young Artists and popular afternoon studio sessions for artists of all levels of experience and ability. 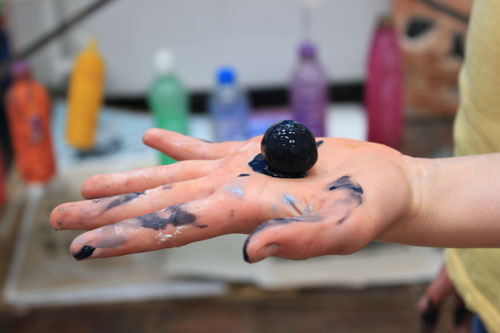 There was drawing, painting, construction, wood, wire, looking, thinking, talking, photography, glitter, poetry, printmaking, sculpting, discovery, hilarity, collaboration, mystification, exploration and questions. Lots of questions. A good time was had by all. Browse photos of the fun and interesting happenings at Room 13 Summer Studio 2013. More photos here on our Facebook page. Former Room 13 MD Rocks at Business! Check out Becks Cosmetics, just one of the successful companies set up by Becks Macdougall, who started her career aged 11 as Managing Director of Room 13 Caol! Here at Room 13 CYC we have some taster sessions that are running from the 5th to the 7th of April. 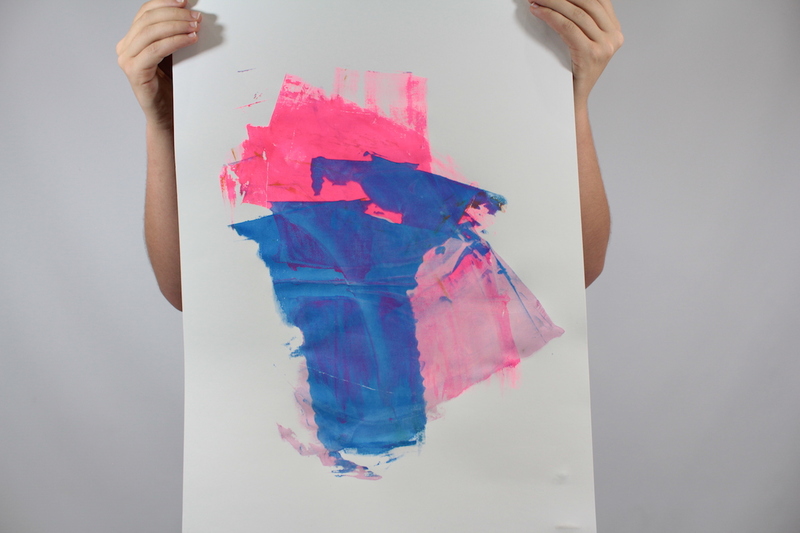 Firstly we are catering to the “Very Young Artists” out there (Ages 5-8). This is already a very popular workshop that gives a chance for an afternoon session with one of our talented resident artists. Come along for a fun filled, creative afternoon over here at Caol Youth Centre on the 5th April from 2:00pm till 4:00pm. Next up we have the very aptly named studio session “Working with.. Stuff” (Ages 9-100). Take a guess what we’ll be doing? We’ll be spending an afternoon with local sculptor Richard Bracken who will lead and assist us with the tools and techniques needed to create our very own work of art. I can’t guarantee that it will be worth millions but you never know what will happen. There’s also the opportunity take advantage of the studio and the wide range of random.. stuff that fills our walls. This is taking place here at Caol Youth Centre on the 6th April for 1:00 pm and finishes around 4:00pm. “Drawing with Confidence” is our last studio session that’s held here at the youth centre on the 7th April (Ages 16+). This workshop is brilliant for those who are thinking about furthering their arts careers and want to explore different methods of drawing and basically, build your confidence with mark making. But you don’t have to be “good at art” whatever that means, to come along – just keen. From 1:00pm till 4:00pm. Room 13 Caol organised an interactive open studio & art installation at My Creative Fort William launch event.